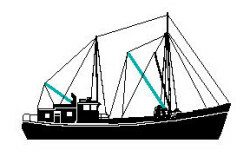 File S/P-8, obtained from Captain Clark B. Fay, Pelican, Alaska - Vessel name Arch Angel, hailing port Alaska, commercial fishing schooner, LOA 65' x LWL 56' x Beam 16' x Draft 11' x 49 Tons - Sea anchor: 24-ft. Diameter Para-Tech on 600' x 1" nylon three strand rode, with 3/4" bronze ball bearing swivel - Full trip line - Deployed in a storm in deep water in the Gulf of Alaska with winds of 75 knots and seas of 30 ft. - Vessel's bow yawed 10° - Drift was uncertain due to 3-4 knot westerly current. 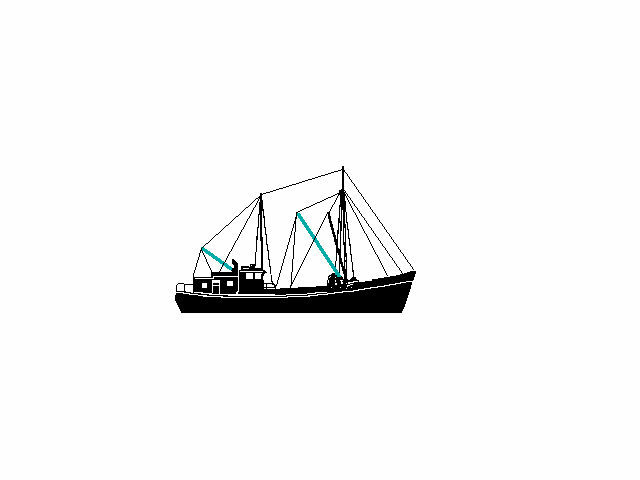 Captain Clark B. Fay is also a veteran of the Alaskan fisheries. He has been through many a gale and not too few storms. Arch Angel weighs in at 49 tons, has a draft of 11 feet and, according to Fay, has been tethered to her 24-ft. diameter Para-Tech sea anchor hundreds of times. I use the sea anchor almost daily during the spring when I am offshore, and occasionally during bad weather in the summer and fall. Only an idiot fishes up here in the winter. A good swivel is an absolute must. I use a commercial fishing swivel that salmon purse seign vessels use on their purse lines, rated at 32,000 lbs. It has three races of stainless steel ball bearings, and the body is made from bronze. Cost is about $200.00, available from Redden Net Co., Bellingham, Washington. With enough line payed out I've never found a catenary (chain) system at all necessary and I wouldn't want to have to haul back the extra weight. I use a Poly-Pro trip line and run it all the way back to the boat, using a power winch to haul the rig back.